Do you struggle with self-sabotaging behaviours when it comes to health? Do you want to find simple and delicious recipes to nourish your body? Are you stuck in a rut with no idea how to get out of it? Do you want to spend some time in a supportive community, eating delicious food, practicing yoga, and connecting with nature? 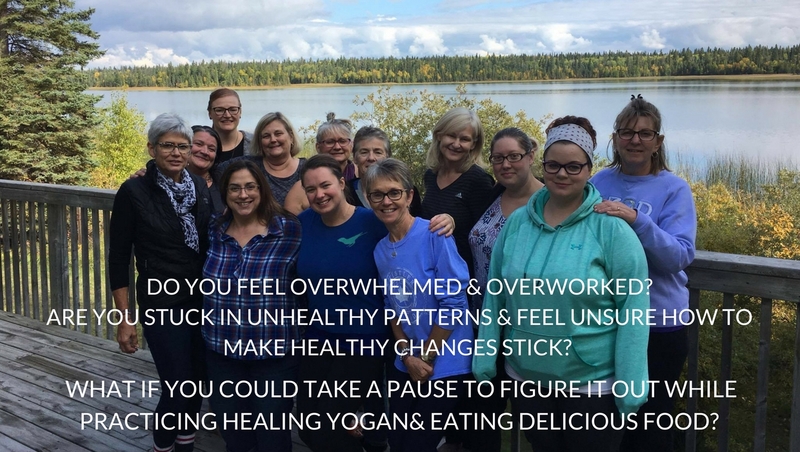 If you answered yes to any of these questions then you’ll want to give yourself the gift of a healing weekend surrounded by a supportive community at the Nourish Yourself Yoga & Wellness Weekend Retreat! Starting November 30th, 2018 Caitlin Iles has got a beautiful, fun-filled, weekend planned at the beautiful Villa Madonna in Rothesay, New Brunswick where you’ll be surrounded by nature and wildlife overlooking the gorgeous Kennebecasis River. You’ll be opening up your body, mind, and soul for renewal, growth, expansion, and relaxation. I’ve had such a great time hosting retreats in Saskatchewan over the last 3 years that I can’t wait to bring the magic home to the East Coast with another women’s retreat weekend chock full of personal growth, yoga, delicious food, community, and reconnection with nature. What if you could be freed of that negative little voice in your head filling you with self-doubt and confusion? Imagine if you could work through that confusion to commit to creating healthy habits that will last a lifetime. Picture a weekend surrounded by supportive women, breathtaking river views, and acres of walking trails, where you can finally relax and let go of stress. Wouldn’t it be nice not to have to cook or clean the kitchen AT ALL, while being introduced to new flavours and meals? How would you feel if you were able to wake up and be guided through relaxing and gentle yoga postures designed to open the heart and relax the mind? How empowering would it be to have simple, delicious, and nourishing recipes to prepare for you and your family and the skills the do it? Join the supportive Nourished community and give yourself permission to let go, relax, and take care of your needs for a weekend. Your body, soul, and spirit will thank you! Check out the schedule below for complete details. Treat yourself to the gift of total health and happiness by joining the magic November 2018! Cait is a Certified Nutritional Practitioner, Culinary Nutrition Expert, and Yoga Teacher with a keen interest in keeping up to date on the latest and greatest in nutrition and wellness research. She is passionate about helping her clients feel happier, more energetic, and totally in love with their lives because she’s been on the other side and knows that there’s more to life than aches, pains, and fatigue. In her practice she focuses on healing the body through gentleness, self-compassion, the latest nutrition research, and time-tested, evolution-based dietary concepts. Her mission is to help my clients change their relationships with food so that they can create their healthiest bodies and their happiest, most fulfilling lives. Creating space for healing at wellness retreats, cooking classes, and live talks is her passion. WHAT DO PAST GUESTS HAVE TO SAY? Click Here if You're Ready to Nourish Yourself! The yoga classes are designed for all levels students, no experience required! We’ll take it slow and use gentle poses to open your body and heart to the possibility of living your best life, while creating new space in your muscles and steadying your mind. This entire weekend is designed to help you reconnect with your sense of self: who you are and what you want! You’ll leave totally inspired and well equipped with the tools you need to kickstart your lifestyle journey and take your healthy habits to the next level. I’m so looking forward to spending the weekend surrounded by wonderful people, supporting and encouraging one another to take the next step on your life’s journey. You can keep scrolling for the complete schedule of your restorative weekend away. I hope to see your beautiful face soon! Enjoy a stroll around the grounds, read a book, get settled in, and leave the real world behind. Shake off the day’s travels with a delicious family-style dinner prepared by Caitlin! A chance to meet one another and share who you are & what brought you to the retreat. We’ll start the weekend with a gentle hatha practice that will move seamlessly into a yoga nidra. This style of yoga is done completely motionless and is designed to get you into a deep state of relaxation to help prepare you for a blissful and rejuvenating night’s sleep! This practice is designed to open your body, mind, and heart to change and a new perspective on life. We’ll awaken our possibilities and become receptive to a new life, experiences, and physical practice. Prepare yourself for a day of learning and growth with a nourishing & grounding breakfast lovingly designed by Caitlin. You might notice a pattern in your life that goes something like this: So often when you try to make positive changes in your life you’ll be successful for a while until something comes up, you get off track, and suddenly you’re right back where you started. In this coaching session you’ll be given the opportunity to dive into the limiting beliefs and self-sabotaging behaviours that are keeping you stuck and preventing your from achieving your health and wellness goals. Once you know what’s holding you back, you’ll be able to create a plan to actively move through these limiting behaviours to the life of your dreams. Reconnect with nature and learn how to meditate in the great outdoors to reduce stress and boost creativity! Refuel your body and soul with delicious, homemade, healing food to balance your energy! This workshop will dive into why intention setting may be a more powerful tool than goal setting when it comes to making positive and lasting changes in your life. We’ll learn fast and simple techniques for how to incorporate this practice into your life. Journal, work on your vision board, go for a walk, read, relax and chat in the common room. 4:30pm-6:00pm—Simplify Your Life: Easy Meals & Snacks on the Go! This workshop includes recipes, handouts, demos, and samples of delicious and super simple meals you can prepare in under 30 minutes to make your life easier and your body healthier! We’ll also talk about, demo, and taste some delicious snacks to whip up so you can make healthy eating on the go a breeze! Zucchini Noodles with Green Power Pesto! No life is complete without chocolate! Sit back with healthy homemade chocolates (and get some recipes! ), fizzy kombucha, and relax with the group! There will also be an opportunity to create your own vision board. In this session you’ll look at the stress response in the body and how you can control it through your breath and with your mind. You’ll learn some breathing techniques, practice some restorative yoga postures, and be guided through a beautiful meditation to help prepare your body for deep and restorative sleep. This practice is designed to help you enter into a deep state of relaxation and release so that your muscles and mind have the chance to rest and repair. Start your day off right with a delicious, nourishing, and healing breakfast lovingly designed by Caitlin! In this workshop you’ll have the opportunity to create a plan complete with your next steps on your healing journey. We’ll explore the importance of building a loving and healthy relationship with yourself, just as you are, before you begin to set intentions or create goals for your future. Together we’ll look at what foods are going to support you, what work needs to be done emotionally and mentally to set yourself up for success and dig deep into the “WHY” behind the changes you’re making. Creating a solid intention behind your goals will help you stick with them when things get tough! From this place of loving kindness, ease, and compassion you will be able to create a tangible personalized wellness plan to guide your next steps. We’ll finish up the weekend by sharing some of our realizations, highlights, and steps we’ll be taking post-retreat to bring your dreams and goals to fruition! Fill your belly and your soul with delicious food before heading back home to put your new skills into practice. Take a last stroll around the grounds, capture your final thoughts in your journal, and say goodbye to the women who have supported you throughout the weekend. Don’t worry, we all stay in touch post-retreat! 2 Nutrition Workshops including CHOCOLATE! CLICK HERE IF YOU'RE READY FOR A WEEKEND OF REST, GROWTH, & CONNECTION! Your body and soul will thank you! Full refund 30 days prior to retreat. $100 deposit kept fewer than 30 days until retreat. No refund if cancelling fewer than 10 days prior to retreat. Retreats require a minimum of 6 participants in order to run. Any personal expenses including incidentals, alcohol, extra food and snacks.